OCZ is a firm that has been catching everyone's attention recently as the first in the industry to successfully break away from SandForce and Marvell controllers found powering most Solid State Drives with its new technology obtained from a buyout of SSD controller firm, Indilinx. 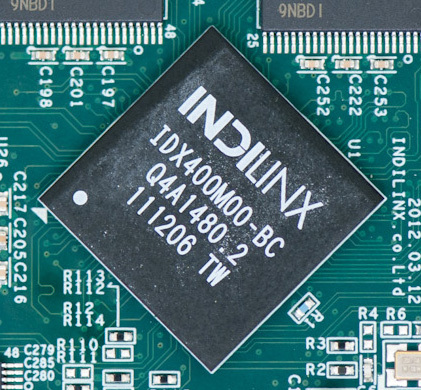 OCZ first entered the market solo with the Indilinx-powered Everest 1 controller, which was to be found in the firm's new Octane series of drives. This controller offered extended life, consistent performance and good value for money, however failed to stack-up to the raw performance of the latest SandForce offerings, specifically OCZ's own Vertex 3 series of drives. This past month, OCZ finally launched its Vertex 4 SSD, powered by the Indilinx Everest 2 controller and, in carrying the Vertex name, the new drive was offered up as a complete replacement for the firm's mainstream SandForce line-up, with reviews indeed backing up the fact that the Vertex 4 was a true competitor when up against SandForce controllers, featuring all the benefits of the Octane series, with enough raw performance to see it come out on-top in most benchmarks. However, it appears as though OCZ has been keeping a little secret. The physical controllers themselves, which make up the Everest offering, are in fact based upon standard Marvell SSD controllers. The Everest 1 controller is an overclocked Marvell 88SS9174, whilst it's suggested that the Everest 2 controller is the new Marvell 88SS9187. This may explain how in some benchmarks of the Vertex 4, Intel SSD 510 and Crucial M4 SSDs hover around similar figures, as these are drives also powered by Marvell controllers. However, quite rightfully, it doesn't all come down to hardware and indeed the firmware found on OCZ's Marvell controllers is written from the ground up by Indilinx, which enables the drive to push in front in some benchmarks, offer up consistent performance and claim greater longevity through advanced storage management. OCZ claims to be working on non-Marvell offerings, however, for the time being, it appears as though the relationship between OCZ and Marvell will remain closer than ever as the firm's controllers continue to power the bulk of OCZ's latest line-up. Credit to Anandtech for uncovering the mystery. Seems a bit silly to me… buy a company that makes controllers for SSD and then just buy a controller from Marvell, pointless? And iirc the drives dont even outperform the M4 so they havent even improved on marvells firmware :P.